USS Boxer (originally CV-21, later CVA-21, then CVS-21 and finally LPH-4) belonged to the famous Essex class of fleet carriers. She was commissioned too late to play an active role in WW2 and first saw action in Korea. She was reclassified an assault carrier in 1952 and an ASW carrier in 1955. From 1959 on, she was used as a helicopter carrier and was hence classified LPH-4. Together with two of her sisters, USS Valley Forge and Princeton, her new role was to land Marine assault troops by helicopter. Thus, the three carriers were the precursors of today's amphibious assault ships of the Tarawa and Wasp classes – yet they could only transport the troops, but not their vehicles and larger equipment. During the 1960s, Boxer mainly served in the Caribbean and the Pacific. Beside her assault ship duties, she was used as an aircraft transport and took part in the space program. She was decommissioned in 1969 and sold for scrapping in 1971. 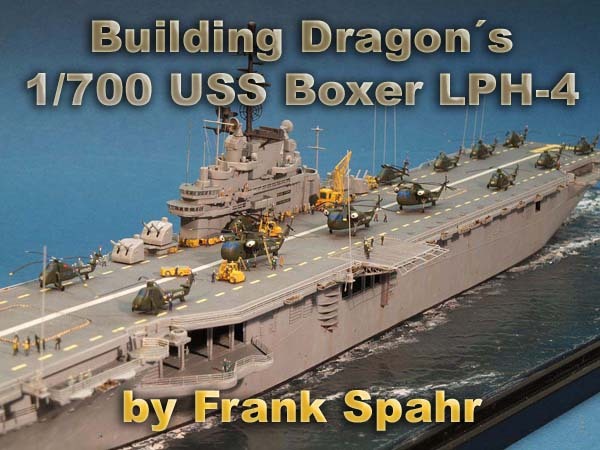 Dragon 1:700 USS Boxer LPH-4, No. 7070, MSRP @ 35 € (grey and clear styrene, PE parts, decals; kit includes two USN tugs as bonus). Click image for an in-box review. Dragon has produced a number of kits of Essex class carriers in various fits. This kit depicts one of the three helo carrier versions, and hence a vessel with only limited changes towards her original configuration. As usual, the box is tightly packed and contains oodles of sprues in grey and clear styrene. Quite a lot of parts will delight the spares box. Two very nicely done navy tugs are included as a bonus. As usual with Dragon, the instructions are brief and cramped other manufacturers do it better in my view. This kit appealed to me who is anything but a USN buff. It looked complete and buildable without much thinking or modifications. Or so I thought. Research – bane or benefit? I soon found out what I would have to change. Boxer as an LPH had retained only the four twin 5 inch turrets as armament, with all the rest of her original AA gone, including the splinter shields. These were retained in the kit and would have to be removed. The kit PE is anything but comprehensive and its selection rather on the arbitrary side. Most notably, the kit cranes would very much benefit from PE replacements. PE railings are only provided for the island, but much more is actually needed. The underside of the deckside aircraft lift is finely detailed with spidery PE, but the extensive catwalks and the numerous whip antennae surrounding the deck have not been addressed. Sadly, only eight UH-34/S-58 helos are provided with the kit, when many more were present on board and oftentimes visible on deck or through the hangar doors. The clear styrene helo rotors are way below the general level of detailing – they should be replaced. The decal sheet is in no way complete, neither where the ship nor where the aircraft are concerned. Finally there are no deck vehicles whatsoever included, neither tractors nor forklifts or the signature Tilly crane. All in all I found numerous issues to address even without going overboard with my researching. I tend to prepare the bases for my models right at the start of the process, when the model is uncritical to handle. I try to complete the base so that I only need to glue or screw the finished model to it, and maybe fill some gaps with acrylic gel. The model's respectable size necessitated the use of Trumpeter's largest acrylic display box. Even though not perfect, I prefer these boxes for the good value for money they give in storing the model dust-free and transporting it to shows. The hull was placed on the base and holes were drilled through the hull stiffeners and the base. Screws were secured to the hull with resin, their length was selected so they could be fastened from below the base with the respective nuts. During the build, the screws were used to hold the model in my vise. For me, this vise has become an indispensable tool as I can handle the model easily without touching it and position it in virtually any desired angle. With the hull screwed to the base, I lightly misted grey paint from my airbrush around it to mark the hull's perimeter in the waterline. I wanted to show the carrier at moderate speed with one of the tugs steaming on her starboard side. After removing the hull, the necessary waves and wakes and any larger structure on the base was sculpted with one component wall spackle from the hardware supermarket. This stuff cures rather fast and both sands and paints over easily. To achieve the slightly irregular surface texture of the water, wall paint was stippled to the base using a large brush you'd use for painting corners of rooms. According to the amount of paint used and the stippling pressure and frequency, you can easily produce all sorts of patterns to your surface. With the wall paint cured, I brought out my airbrush and various blue and green hues of acrylics and sprayed the base, aiming at lighter and greener shades closer to the hull and especially astern. This is fun, it is not hard, and it's easily corrected. When I felt I had done the best I could, I set the base aside to dry. This is especially important at this stage, as all the previous materials are water based, and excess moisture needs time to evaporate. Otherwise, bubbles will appear after sealing the base. The sealer I use is gloss clear lacquer in a rattle can, also from the hardware supermarket. It's solvent based and effectively seals the surface after some passes, bringing it to life and reflecting the light virtually like water. One word of caution - even if this clear coat feels dry to the touch, it may still not be fully cured and still be able to glue a model temporarily left on the base to it. Allow a few weeks before you feel secure about that. I learned it the hard way, with a 1:700 Flower Class somersaulting on a tile floor. You don't want to live through that. Believe me. Master modeler and friend Frank Ilse counseled me years ago always to start at the centerline of the model and then work towards its periphery – thus minimizing the risk of accidentally destroying things already completed. I've tried to heed this advice ever since. In this case, the starting point obviously was the hangar. I spent some time thinking about viewing angles and then decided which of the doors to open and which to close, and what to display where in the hangar to make it look busy with minimal effort. Torben Keitel suggested using lots of boxes to block the lines of sight where wanted, so I made a lot of them from styrene stock. two of the kit helos were also placed inside the hangar, together with a goodly number of Lion Roar crew figures. As I mainly use acrylic paints, it wasn't that easy to find proper USN shades, but I did find some equivalents. I substituted the ubiquitous haze grey with Vallejo Sky Grey and Deck Grey with Vallejo Dark Blue Grey. The hangar bulkheads were painted off white, using JPS RAF White. The helos posed problems of their own. I personally don't like clear styrene and wouldn't be sad if the manufacturers reversed their trend of molding particularly exciting parts in clear. The stuff is brittle and harder to clean up, as I find it hard to see excess material. In this case, I had to do the serious cleanup after priming the helo. The kit decals turned out to be too small, but luckily Starfighter Decals has a great sheet on the LPH´s, which I immediately ordered. This sheet has very useful decals for both the ship and vast numbers of helos. As usual with Starfighter decals, the sheet has a continuous carrier film and needs careful trimming of each individual decal. While I was waiting for the decals (which arrived as fast as usual with this manufacturer), the two hangar deck helos were completed retaining the kit decals, all the numerous others would receive the aftermarket decals. Parallel to working on the hangar deck, I painted and weathered the flight deck, with obviously different wear patterns from a carrier with fixed wing aircraft. Various oil paints applied by drybrushing plus some washes worked fine. Prior to decaling the flight deck, it was sprayed with clear gloss to prevent silvering. Both the quarterdeck and the foredeck needed some rework to remove the molded on splinter shields. Some filling and sanding was needed. Now I was able to paint and lightly weather the hull sides. Thinned oil paint worked well on the acrylics. "Marrying" hull and flight deck was an interesting experience, as I needed to apply considerable pressure. If I had tried to use the clear styrene flight deck, at this point I would most certainly have failed, as in no way would I have been able to prevent glue from running under it and blinding the plastic. As I mentioned above, I don't regard the extensive use of clear styrene on ship models as progress or improvement, especially not in small scale like 1:700. Continuing the work, I started with all the features around the hull. Courtesy by Guido Hopp, I was lucky in having received a pre-production sample of Lion Roar´s PE USN carrier cranes fret. These parts were way more convincing than the kit items. I also started adding the numerous railings and the fiddly fore and aft catwalks. These were made from Saemann PE grating stock, styrene stock and PE railing, very carefully glued in order not to block the gratings. I also did the deck markings, which were partly masked and sprayed, and partly made using the kit decals. Additional decals were used from the Starfighter sheet, though not their landing spot markings as I couldn't find them in the reference images from the period I aimed at. I was particularly intrigued when I could read the ship's name at her stern, but the additional markings for the island improved its look, too. It all went fine and the markings looked as if they were painted on. Working on ships means you oftentimes have the opportunity of procrastinating a particularly unnerving subassembly in favor of something less fiddly. In this spirit, I tackled the gun turrets and the island. The only fiddly thing was the main radar dish, which was very iffy to work on. Even worse was building the PE aircraft lift supports, as the PE is very soft and bends very easily. Only a good amount of patience, CA glue and some Mr. Surfacer helped to get this item completed. Now I was past avoiding and procrastinating, I was forced to tackle the eighteen whip antennae festooning the deck I had identified on the reference images. They all had individual bases with counterweights and could be lowered or raised in the real ship. As I had seen them on many images, I felt the need to somehow replicate them on my model. After some attempts, they were made from styrene stock, sections of brass tubing, some brass sheet, pieces of 1:250 scale PE railings and pieces of stretched sprue. I had originally made the antennae from .2 mm brass wire, but that was too thick and had to be substituted with stretched sprue. Mounting the eighteen bases to the catwalks and adding the appropriate railings severely tested my patience. The antennae themselves were mounted only later to prevent breakage. Another visible and missing feature were the numerous floater net baskets. They are readily available from Lion Roar, and with some practice build easily. I just didn't know what to put into them – making nets with floating devices in 1:700 is nothing obvious in my book. I found my solution when I opened a teabag and saw the dusty tea inside. So I put some tea dust into each basket and added clear lacquer to glue the particles together. A washing with tan acrylic completed the procedure. Now the whip antennae were added, and some rigging of flag lines was done using tan stretched sprue. Now the vessel was virtually complete, yet still waiting for the airgroup. I had decided to get more UH-34 for a fuller deck, but also wanted some of the unusually looking S-56 Mojave. Both are available as resin/PE sets from WEM, but the S-58 were sold out and unavailable for the foreseeable future. So I only got the Mojaves plus some PE sets for the S-58 I already had, as their clear styrene landing gear was overly brittle and the styrene rotors definitely too coarse. The Mojaves were soon built and painted, and looked fine. I beefed up the rotor hub and the wheels with white glue, and applied the Starfighter decals. With a measly nine helos, the deck still looked like a plate at a gourmet restaurant, so I asked around and received help. My friend Christian Bruer had some Fujimi helos, and Norbert Thiel of NNT gave me a PE fret of his excellent Atlantic Conveyor kit which contains all the landing gear and rotors you can wish for. Having built the helos, things looked way better. For the finishing touches, I received advice and help from Frank Ilse. He had leftover deck vehicles and PE from a GMM USS Saipan fret he kindly gave me, including a correct Tilly crane. Now I was able to build some forklifts and tractors, which was tricky but could be done, and now it was time to arrange the deck and bring it to life. Some research (mostly asking Frank, actually …) showed me who's who on a flight deck and their respective colored jerseys. So I repainted a number of my PE figures. I ended up with khaki officers, light blue naval crew, tractor drivers in blue, plane captains in brown, plane handlers in green, plane directors in yellow – and of course marines in olive. Frank also gave me some hints on how to display the figures in credible arrangements and poses, so I sat down one rainy sunday and started crewing the ship. I didn't count the figures, it must have been about 150 of them – almost all of them do something credible and most of them interact with others. There's life on the flightdeck without just distributing the figures evenly. Some are watching the tug closing in on the carrier, some are working on helos and equipment, some take a break – so hopefully it looks as it really would during a break in flight ops. To hide glue spots, the entire model was then sprayed Vallejo Model Air Matte varnish, which works just great out of the bottle. Now I was able to finally mount the model to the base, and I declared the build complete. It was quite some fun, as always there was a lot to be learned, and some things developed quite different than expected. Many thanks to my friends, the German Gamblers, all of whom have helped in this project!